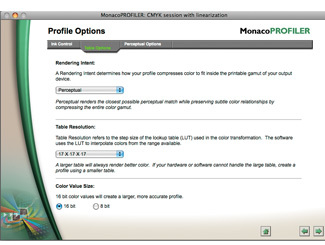 Ideal for commercial and fine art photographers and graphic arts professionals who prefer a wizard-based approach to color management, MonacoPROFILER Platinum offers expert profiling, diagnostics and editing tools for all of your input and output devices, including scanners, digital cameras, monitors and wide-gamut, extended color printers. 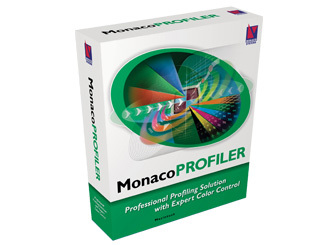 MonacoPROFILER Platinum is a powerful and flexible wizard-based solution designed to help commercial and fine art photographers and graphic arts professionals save time and money by easily creating and editing custom ICC profiles. 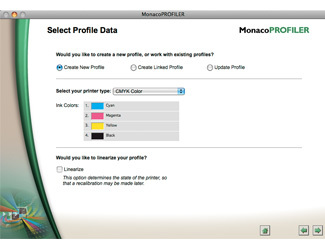 Simple to use, a software wizard walks through the process to profile, diagnose, and edit profiles for displays, scanners, printers and digital cameras. 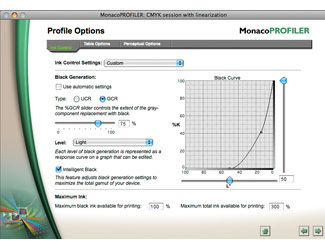 Delivering precise color output for any technology, MonacoPROFILER even supports up to 8 inks and 8 discrete colors, providing the flexibility to color-manage your wide-gamut, extended color printers. 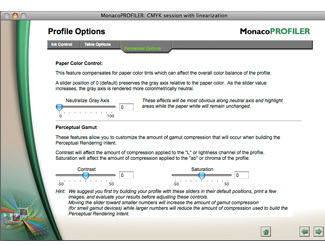 Since MonacoPROFILER Platinum is ideal for all RGB/CMYK/PANTONE® Hexachrome/Multi-Ink Printers and for both the production and simulation of colors using spot-color inks, it’s the perfect solution for fine art and commercial reproduction studios, photo labs, small print shops, service bureaus, large format print vendors, and high quality print shops. 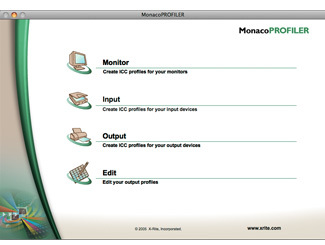 +Where can I find Monaco reference files prior to 2005? +Why Do I Set 200DPI for Scanner Profiling? -Activation Code - - How do I Complete Registration? -Do I Profile an Epson 2200 as RGB or CMYK? +Can I Profile for Color Negatives? +Monitor Profiles: How Do I Use Them? +Soft-Proofing in PhotoShop - - Why? +Where does PhotoShop CS Look for Scanner and Printer Profiles? +Can I Profile My Laptop LCD? +How do I set LCD White Point, Brightness, and Contrast? +Monitor Calibration - Which White Point is Correct? +Set Contrast and Brightness - What's Going On? Monitor Image is Lighter (Darker) than Printed Image - Why? -Error Installing on Some Macintoshes - "Insufficient Memory"
-Error when Installing: "Failed to initialize Monaco Profile Object"